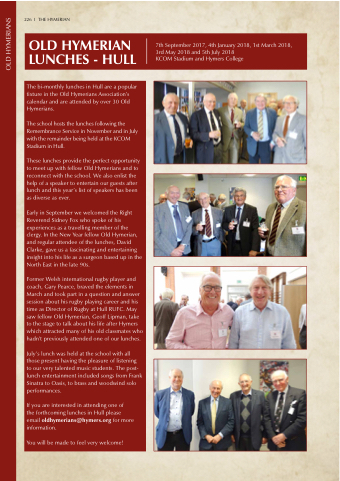 The bi-monthly lunches in Hull are a popular fixture in the Old Hymerians Association’s calendar and are attended by over 30 Old Hymerians. The school hosts the lunches following the Remembrance Service in November and in July with the remainder being held at the KCOM Stadium in Hull. These lunches provide the perfect opportunity to meet up with fellow Old Hymerians and to reconnect with the school. We also enlist the help of a speaker to entertain our guests after lunch and this year’s list of speakers has been as diverse as ever. Early in September we welcomed the Right Reverend Sidney Fox who spoke of his experiences as a travelling member of the clergy. In the New Year fellow Old Hymerian, and regular attendee of the lunches, David Clarke, gave us a fascinating and entertaining insight into his life as a surgeon based up in the North East in the late 90s. Former Welsh international rugby player and coach, Gary Pearce, braved the elements in March and took part in a question and answer session about his rugby playing career and his time as Director of Rugby at Hull RUFC. May saw fellow Old Hymerian, Geoff Lipman, take to the stage to talk about his life after Hymers which attracted many of his old classmates who hadn’t previously attended one of our lunches. July’s lunch was held at the school with all those present having the pleasure of listening to our very talented music students. The post- lunch entertainment included songs from Frank Sinatra to Oasis, to brass and woodwind solo performances. the forthcoming lunches in Hull please email oldhymerians@hymers.org for more information. You will be made to feel very welcome!